I would like to discuss something that I feel very passionately about. That's right. Your hair part. I never paid much attention to the part of my hair before m'lady hair dresser told me something I will never forget. And neither should you! The advice she gave me is key: The roots of your hair get lazy. If you don't change up your part often enough, your part will end up looking like Ms. Lorelei (sp?) on the left. Can you tell how thick her part is? It always drove me nuts that nobody fixed it on her crew. She needs desperately to change her part so she can get a skinny part like Rory (on the right). I only used them as examples because her part stuck out in my mind. Anyways, change your parts, ladies! It is possible with a little bit of training. If it won't stay put, try parting it differently right after you wash it and then put some product in it to make it stay. The more you make it go, the better it will stay put. I know it's a little judgmental of me to notice people's parts...and I know it's also pretty silly. But once my hair dresser told me this, I couldn't help but see it on other people and to work on it myself. It does make your hair look quite healthier, and it even gives it a little more volume. Take it and run with it! Hmm...very interesting. I don't think I have ever noticed that before. I just starting parting my hair to one side YEARS ago because I hated a mole I had on that side of my face. But you're right, it does look a bit more flatter on Lorelei. I normally change my parting everyday depending on how my hair falls, I don't try and fight it! Great observation, I always wondered why some people had thicker parts. Oh dear, I'm going to be noticing it more on people now. visiting from SITS and love that show too. Never thought of that as parting my hair. I always just part my hair in the middle, I hate parting it on either side. However I do lack volume so maybe I'll try it and see if it helps.. Stopping by from SITs, congrats on being featured! Happy SITS Friday Potluck! I hate parting my hair any other way, so you'd hate my part, no doubt! LOL! Enjoy your day. I've always been more fussy about my makeup than my hair. Mine's curly,a and for as long as i remember the part has always been in the middle. i'll remember this advice. Thanks for the tip. Mine tends to go where ever it wants, but maybe I'll try to tame it now. I've never heard of this. I'm going to try it. I definitely need the volume. Happy SITS Friday Potluck!! Popped over from SITS. Happy SITS Day! Very interesting concept but one that makes sense. Great tip - I better go brush my hair! Visiting from SITS! okay...I'm going to try it this weekend..I'm a little scared, but i'm gonna go for it..wish me luck! That is a very useful tip, and I had not known that your hair thickens because of the part. Won't it have more strength because it thickens? And perhaps be a bit better for health? Why has no one ever told me this before? Thank you, thank you, thank you! Hi! Popping by from SITS Friday Potluck! Great blog! Hmmm Looks like I'll be trying something new today:) Great advice and something I never really gave much thought to before. Congratulations on being a featured blogger on SITS! I never thought about that. I just let my hair fall into its natural part. I really don't want to end up with a huge one like that! That is a very good tip! Thanks for sharing! Thank you for your great advise. I will remember it. Stopping by from SITS. Great parting advice! I change my part frequently because I like the extra lift it gives at the roots. Congratulations on being featured on SITS Potluck Friday! UGH! You're not the only one, when I notice a part like that it drives me insane. I just want to fix it. Or when people do the weird Grudge part straight down the middle and let their hair hang in front of their faces. Can't say I have ever noticed hair parts. It's funny what bugs one person and not another. I used to have terrible teeth and now I notice teeth. Huh. I'm stumped. I never knew that was the reason my scalp would show so much. I just let my hair fall where it may, but now I'm going to try this. I hope my hair lays down though! lol! I used to change mine from time to time, but have forgotten about it! I'll need to try again the next time I go for a cut. It'd look wonky if I did it with my cut just any old time. I switch mine up a lot, just for the variety....good to know it helps keep my hair on it's toes (roots?)! Hmmm, every time I've ever tried to change my part my hair has rebelled. I have very thick, wavy hair and it drops in the same place all on its own. I'll have to see if I can beat it into submission. Stopping in from SITS, congratulations on making potluck Friday! I have fine hair; my natural part is on the right but after reading this, I went to the mirror and switched it to the left - I see it now looks as if it has more volume and gives a totally different look! Who'da thunk it??? THANKS. by the way, your pics on the side? You guys just get better and better looking as the pics progress. Wow, I never thought of that - thanks!! the pics of you and your fiance are ADORABLE!!! Thanks for sharing this advice! I change my part all the time, though it's usually on the same side. Occasionally I'll switch it up. 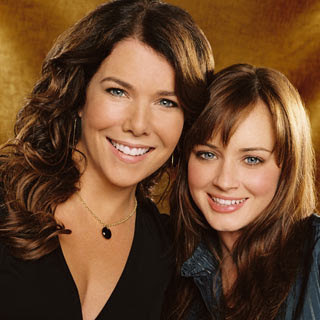 I have really fine hair, so I can't afford to have a wide part like Lorelai. I'd look bald! Visiting from SITS! I have never thought of that! I have a cowlick which makes my hair naturally parts on the right so I've never fought it but maybe this weekend I will switch it up and walk on the wild side with a part on the LEFT! Yeah, now we're ALL going to be noticing it! Actually, I've been trying to fix my part, so I notice others all the time. I don't know what I'm doing...my hair is so thin, so no matter where I part, it'll be pretty wide. I'll have to play around with it some more! Happy Friday Potluck from SITS! I think my part is more Lorelei than Rory! Ack! Thanks for the advice! Agreed. The overzealous part needs to be stopped. I am going to notice that on everyone now! Stopping by from SITS! Have a great weekend! I suppose I never really thought about it before. But I love that you used the Gilmore Girls as examples! I'm constantly changing my hair part b/c you're right, it makes a huge difference! Hope you have a great Friday! You have a very cute blog! I'm a new follower! Oh my goodness! That is hilarious! I never ever noticed that! Great tip!! yes i've heard this before....after a quick check, it's time for my part change =) Happy Potluck Friday!!!!! I love love your photo timeline on your blog, that's awesome. Happy SITS Friday Potluck! I had long hair for years and was always changing my part...but went short a few years ago and it was harder to do...longer again, so I need to get back on the wagon! Sorry, got excited when I saw the picture. I love that show. ahhhh, Gilmore Girls!!! I LOVE that show! as for my hair, I don't really part it - it just does what it wants to! I actually heard that from a hairdresser, too - to let your hair part naturally and not fight it. It seems to work for me! That's a great idea! I'm going to give it a try. The part in my hair has been bugging lately, this may just be the fix I need. Thanks! Changing your part is also a great way to switch up your look without spending tons of cash! Thanks for the reminder - I'm off to change my part! Stopping by from SITS. Thanks for the hair advice. I never thought of doing that before. I'm probably going to start obsessing about my part and noticing other people's parts now, too. Stopping by from SITS. I'm so glad you shared this tidbit. I never knew this. I used to change my part every so often just to keep things different, but lately I've gotten lazy myself and haven't changed it up and I have noticed that my part seems to be getting "bigger". Guess now I know why and it's time to go back to the other side! Stopping by from SITS. This is a good tip and something I never thought of. I remember switching my part from side to side in high school but now I have the Lorelei part and it only goes one way. Maybe I need to use some gel and force it to go left? Stopping from SITS! I never really thought about this. I don't ususally wear a part. Thanks for the tips! I kind of have hair like Rory, so I'm safe phew! Visiting you from potluck Friday at SITS. Have a great wknd! That's one of those things I've never thought about, but it makes sense. I'll be obsessing over my part now! Stopping in from SITS. Congrats on being in on the pot luck! I try to change it up fairly often. I think I will try using some clips too. That will help it stay in the new part. Bobbie pins are nice also. Stopping by from SITS. I always switch my part, but I actually did notice that it had been a while when my part started to look like your example. Good reminder. oh that is so cool! I never knew that!!! Congrats for getting featured on SITS today, I'm glad you were, just love your blog. NOw a follower, so I'll be back! Wow! That's something I never thougt about. My part is very natural. I'll give it a try. It will feel wierd! Congrats on you SITs day!! Great blog - I'll be back! I agree! My hairdresser nags me to change me hair parting every time I go to her! It's hard though. We're such creatures of habit, and somehow it kinda looks "off"? Haha! Ooo! Good tip! Stopping by from SITS. Nice advice!! I have natural blond hair, So my part isn't that obvious. Do you think I still need to change it? It's Potluck Friday at SITS and you are IT. COngrats! I hope you have a fabulous SITS day. UGH, I have a horrid cowlick so I pretty much have 2 choices for a part. Down the middle, or slightly to the ONE side only. Annoying!! Great tip, although I didn't realize what it would do! I used to always part the same, now I spray root lifter and dry upside down (I tend to have flat hair!) and then let it fall where it will. Always on the same side, but always a little different! Happy potluck day! It's so annoying when actresses have something wrong with their hair or makeup that you KNOW could easily be fixed by the studio. Good thing I never watched Gilmore girls! Stopping by from SITS! I love the Gilmore Girls!! Oddly, I was thinking about parts this morning! I want to change mine, but a) im lazy, and b) its tough! Thanks for the kick in the booty to do it!! See, the only problem is that whenever I change my part, I discover a whole colony of gray hairs I didn't know existed! Ah well. Still gonna give a shot though! Stopping by from SITS. Interesting advice! I'm going to try a part change! Stopping by to say hi from another FB today...I am trying to climb out of my inbox...it is so full! Wanted to come and meet the others and say hi. I am your newest follower! I agree - I hate those baldy parts! As a woman of a certain age I need to keep all my hairs in the right place. Stopped by from SITS-hope you have a great weekend! Very interesting! I never knew that! I am a new follower! Come visit me at Mama's Little Chick. Congrats on the SITS day. Off to re-train my hair now...1! Happy SITS Potluck Day from Helsinki, Finland! Uh oh.....My lazy part might explain a few things....Fun post and enlightening! Stopping by from SITS~~ Happy Saturday Sharefest!! I never knew that. It makes sense, though...I'll have to make an effort to part mine differently. It is HUGE and tries to tell me it is in charge of my hair part instead of me! Can you believe that! I have never really thought about this but you are totally right! :) Stopping by from SITS!